Edsger Wybe Dijkstra (Dutch: [ˈɛtsxər ˈʋibə ˈdɛikstra] ( listen); 11 Mey 1930 – 6 August 2002) wis a Dutch computer scientist an an early important feegur in mony resairch auries o computin science wha held the Schlumberger Centennial Chair in Computer Sciences at the University o Texas at Austin frae 1984 till his retirement in 1999. ↑ Hoare, C. A. R. (12 October 2010). "The 2010 Edsger W. Dijkstra Memorial Lecture: What Can We Learn from Edsger W. Dijkstra?". Department of Computer Science, The University of Texas at Austin. Retrieved 12 August 2015. ↑ Ryder, Barbara G.; Soffa, Mary Lou; Burnett, Margaret (2005). Impact of Software Engineering Research on Modern Programming Languages. ACM Transactions on Software Engineering and Methodology, Vol. 14, No. 4, October 2005, p. 431-477. ↑ Wirth, Niklaus (2008). A Brief History of Software Engineering. IEEE Annals of the History of Computing, vol.30, no. 3, July–September 2008, pp. 32–39. ↑ In his 2004 memoir, "A Programmer's Story: The Life of a Computer Pioneer", Brinch Hansen wrote that he used "Cooperating Sequential Processes" to guide his work implementing multiprogramming on the RC 4000, and described it saying, "One of the great works in computer programming, this masterpiece laid the conceptual foundation for concurrent programming." 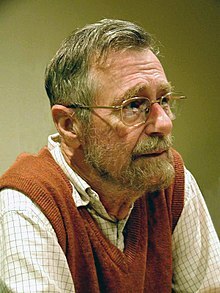 ↑ As Lamport (2002) wrote, "Edsger W. Dijkstra started the field of concurrent and distributed algorithms with his 1965 CACM paper "Solution of a Problem in Concurrent Programming Control", in which he first stated and solved the mutual exclusion problem. That paper is probably why PODC exists; it certainly inspired most of my work." ↑ Lamport, Leslie. "Turing Lecture: The Computer Science of Concurrency: The Early Years (Communications of the ACM, Vol. 58 No. 6, June 2015)". ACM. Retrieved 22 September 2015. ↑ Lo Russo, Graziano (1997). "An Interview with A. Stepanov (Edizioni Infomedia srl.)". STLport. Retrieved 30 August 2015. ↑ Hoare, Tony (March 2003). "Obituary: Edsger Wybe Dijkstra". Physics Today. 56 (3): 96–98. doi:10.1063/1.1570789.